If the player collects five, they will form a Power Star. 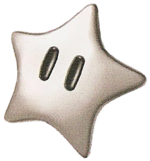 Silver Stars are Stars that first appear in Super Mario 64 DS, and return in Super Mario Galaxy and Super Mario Galaxy 2. In all of the games that they are present, Mario (or any other playable character) must collect five of these Stars in some levels to form a Power Star. According to a Honeybee in Super Mario Galaxy 2, the five Silver Stars fall from the sky. Silver Stars are introduced in Super Mario 64 DS, being a new feature to the game. In some levels, the player must collect five to get a Power Star that will appear inside a Star Sphere. They are found in several courses, including Battle Fort and Sunshine Isles. If a character gets damaged while holding one or more Silver Stars, he will lose one and it will scatter and bounce around the area nonstop. The player must catch it again to retrieve it. The touch screen shows the location of these stars. Silver Stars can only be collected if the Silver Stars mission is chosen from the menu. Similar physics are used in the multiplayer mode of Super Mario 64 DS and the missions may have been the inspiration of the multiplayer mode or the other way around. However, in multiplayer, the Silver Stars are replaced by Power Stars. Bob-omb Battlefield 5 Silver Stars! Mario, with two Silver Stars, at the Dusty Dune Galaxy. Silver Stars reappear in Super Mario Galaxy having the same role as in Super Mario 64 DS. This time, they float in Star Spheres, and the player will not lose one if they manage to take damage. The Stars also float around Mario, unlike in Super Mario 64 DS where they "disappear" after being collected. When all 5 Silver Stars are collected, a cutscene shows the five Silver Stars merging into a Power Star. Silver Stars appear again in Super Mario Galaxy 2, having the same role as they did in the first game. A Silver Star inside a Star Sphere, from Super Mario Galaxy. A Silver Star outside a Star Sphere, from Super Mario Galaxy. In Dusty Dune Galaxy, the 5 silver stars form a Green Star, instead of just a regular Power Star. In both Super Mario Galaxy and Super Mario Galaxy 2, when a Silver Star is collected, it makes the same sound as a Luma would make. This page was last edited on April 4, 2019, at 21:51.